Thus, because Christian morality leaves animals out of account ..., they are at once outlawed in philosophical morals; they are mere "things", mere means to any ends whatsoever. They can therefore be used for vivisection, hunting, coursing, bullfights and horse racing, and can be whipped to death as they struggle along with heavy carts of stone. Shame on such a morality that is worthy of pariahs, chandalas and mlecchas, and that fails to recognize the eternal essence that exists in every living thing, and shines forth with inscrutable significance from all eyes that see the sun! Just as the dark [skin] colour is natural to man, so too is the vegetable diet; but only in a tropical climate does he remain true to the latter as to the former. When he spread to the more frigid zones, he had to counteract the unnatural climate by an equally unnatural diet. Right in the north one cannot exist at all without animal food. uring Friedrich Nietzsche's visits to Triebschen in 1869 Wagner, who was otherwise impressed by Nietzsche, was scornful of the young professor's commitment to vegetarianism; despite the fact that, under the influence of Mathilde Wesendonk, he had already developed an interest in the rights of animals. Wagner had learned from his mentor Schopenhauer that mankind was a species distinguished from other animals only by our capacities for reason and compassion. It was from sympathy with our fellow-creatures that Wagner progressed towards vegetarianism; although he never became a total vegetarian. He knew the writings of Georg Friedrich Daumer (1800-1875); perhaps he first encountered this poet and philosopher in his translation of poems by Hafiz. Wagner later acquired several of Daumer's books on philosophy and religion, and Cosima's Diaries mention Daumer several times. Among those books was an account of the foundling Kaspar Hauser, to whom Daumer was tutor. Wagner was struck by Daumer's argument that man's original diet was vegetarian (a view that he had already met in Schopenhauer's Parerga und Paralipomena) and that the moral and physical decline of mankind was the result of the change to an unnatural diet that included meat. Daumer noted that the behaviour of Kaspar Hauser — who in his wild years had only lived on wild fruit and who, in his first few months of captivity, lived on bread and water — deteriorated as soon as the boy was introduced to meat dishes; which at first he refused. Kaspar became unco-operative and, according to Daumer, "the nobility of his nature disappeared". Daumer also wrote of how the adoption of a vegetarian diet had caused an improvement in his own health. ome years later (and no earlier than 1880), Wagner was sent a tract written by Jean Antoine Gleïzès (1773-1843), Thalysia oder Das Heil der Menschheit (originally published in French 1840-42; German translation 1872), in which the author argued that Christ's mission had been to end the eating of flesh: according to Gleïzès, this was the true meaning of the bread and wine of the Last Supper. He also argued, like Schopenhauer, that man was raised above other animals by his capacity for compassion. Wagner was impressed by the arguments of Gleïzès, perhaps even more so than he had been by the similar ones put forward by Daumer. Wagner synthesised the ideas of these writers with the views of Schopenhauer (as quoted above) in his essay Heldenthum und Christenthum (Herodom and Christendom, 1881), in which he contrasted these ideas about diet with those of Count Gobineau (whose views Wagner's essay treated with too much respect, to the subsequent harm of Wagner's reputation). Following Gleïzès and his own opinion that in the teachings of the great spiritual teachers (lost or distorted in the religious books written by their disciples) there was a common core of teaching, Wagner claimed the support of "the noblest sages of all time" for the belief that the cause of mankind's degeneration was the substitution of flesh for vegetable food. Below: Parsifal Act 1 in the 1989 Bayreuth production by Wolfgang Wagner. 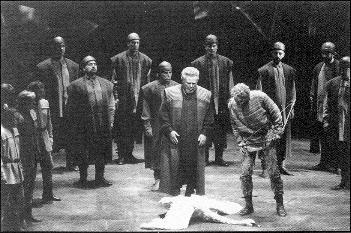 Parsifal: William Pell, Gurnemanz: Hans Sotin. ©Bayreuther Festspiele. Against Vivisection: Wagner's "open letter", published in the Bayreuther Blätter, as translated by Wm. Ashton Ellis. ere Wagner is alluding to Schopenhauer's teaching that the best aspects of Christianity were those which it shared with Buddhism and Hinduism, whereas the worst aspects of Christianity were those which it had inherited from Judaism. These latter included the Judaeo-Christian attitude to animals, which in the Old Testament (Genesis 9 v2) had been given by Yahweh into the stewardship of Noah and his descendants. For Schopenhauer and therefore also for his disciple Wagner, the idea that men could deal with other animals (including birds and fishes) as they liked, as if animals were things rather than conscious beings, was abhorrent. The world is not a piece of machinery and animals are not articles manufactured for our use. Such views should be left to synagogues and philosophical lecture-rooms, which in essence are not so very different. When first it dawned on human wisdom that the same thing breathed in animals as in mankind, it appeared too late to avert the curse which, ranging ourselves with the beasts of prey, we seemed to have called down upon us through the taste of animal food: disease and misery of every kind, to which we did not see mere vegetable-eating men exposed. The insight thus obtained led further to the consciousness of a deep-seated guilt in our earthly being: it moved those fully seized therewith to turn aside from all that stirs the passions, through free-willed poverty and total abstinence from animal food... In our days it required the instruction of a philosopher who fought with dogged ruthlessness against all cant and all pretence, to prove the compassion deep-seated in the human breast the only true foundation of morality... For our conclusion should be couched as follows:- That human dignity begins to assert itself only at the point where man is distinguishable from the beast by compassion for it, since compassion for man we ourselves may learn from the animals when treated reasonably and as becomes a human being. ven if Wagner's endorsement of vegetarianism and opposition to vivisection postdates the completion of his text for Parsifal, there is a connection. In the passage quoted above Wagner refers to Schopenhauer's ethics (which Wagner had absorbed in the 1850's); in which it is argued that compassion or sympathy is the only true foundation of morality . This teaching lies behind the text and dramatic action of Parsifal, as can be seen in the incident of the wounded swan in the first act. Gurnemanz accuses Parsifal not merely of killing a creature for sport but of murder; this tells us that here, in the domain of the Grail, all creatures are accorded equal respect with humans. The old knight shows Parsifal the suffering that he has caused; he makes him look upon the face of the dying swan. By doing so he prompts Parsifal to feel shame at his misdeed and compassion for the fellow-creature whom he has harmed. With the first stirrings of his compassion Wagner's Parsifal takes a first step towards enlightenment. While the libretto of Parsifal opposes the killing of animals, it does not (as some commentators have claimed) advocate vegetarianism. The Grail knights eat neither animals nor plants, while they are nourished by the divine food provided by the Grail. When Amfortas denies them that nourishment, they resort to eating roots and herbs, not from choice but of necessity.